Meet Paul a new member to our team. Paul has a vast amount of experience in electrical and electronic repairs and has visited our workshop several times over the last few months helping us repair several devices - even those outside our usual scope of repair. 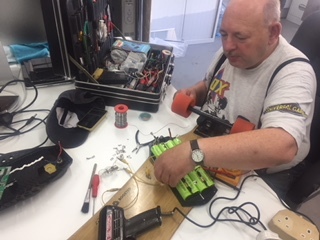 Over the last 30 - 40 years Paul has repaired, Home Entertainment Equipment, Disco Equipment Repairs such as amplifiers, lighting equipment and mixers, Guitars and Juke Boxes, Dyson Vacuum Cleaners, completed PAT testing for several businesses and much more. In fact we have a comprehensive list below of all the various repairs he has done over the years. Paul is a very ambitious, talented and intelligent individual within the electrical and electronics industry and has taught us a lot over the last few months and it is a pleasure to have him as part of the team. Paul works with us on a part time basis so if you have any of the devices above that require repair please contact us to schedule a repair by calling our usual number 01494 534 008 or using the quote form below.